The first place Cubs are back in the friendly confines to begin a six game home series starting with the last place Milwaukee Brewers. However, with tonight’s starting pitcher’s records, you’d think they were on their respective teams opponents. 1-2 Kyle Hendricks faces 3-1, Jimmy Nelson. Should be interesting for Cubs hitters with Jimmy in, either they’ll strike out several times or knock bombs off him. The wind should be blowing out for another W.
I was wrong by game time, the wind was actually blowing in from right. Well here we go. Hendricks would start off with a 1-2-3 inning but would walk the first batter of the second, Chris Carter. He would end up at third on Kirk Nieuwenhuusdouvle to center. Aaron Hill would send a fly ball to left scoring Carter on a sac fly. That would be the only run Kyle would give up. He’d strike out four walk one and only give up one more hit through five. Nelson would cruise through four innings with out much damage but it would be the fifth, where he’d lead off Soler with a walk, Russell would single and David Ross would move them over with a sac bunt. Madden would pinch hit for Hendricks. Tommy La Stella would walk, loading the bases. Fowler would send Soler across the plate with a sac fly to center. Heyward would ground out to end the inning. Adam Warren would cruise through the sixth and seventh inning retire all six batters he faced. In the bottom of the sixth, Bryant would reach on an error and would move over to second on a Ben Zobrist walk. Carlos Torres would come into the game getting Soler to fly out but would give up a triple to center field scoring both Bryant and Zobrist. Cubs up 3-1. Javier Baez would lead off the bottom of the seventh with a single to center and would be called out trying to steal second. The Cubs would challenge and it would be over turned. Bryant would walk, then Rizzo would double scoring Baez, putting the Cubs up 4-1, giving Adam Warren a chance at the W.
A bunch of changes would happen but basically Pedro Strop would come into the eighth with not his best stuff. He’d walk Aaron Hill and on the next batter throw a wild pitch advancing Hill, who would end up at third on a ground out. He would walk Colin Walsh, setting up pinch hitter Ryan Braun, who would double to right. Strop would make it interesting but would get a strike out before Travis Wood would come in to finish the inning. Michael Blazek would make it an exciting bottom of the eighth by loading the bases but would ultimately end the inning with out any more runs. Hector Rondon would come into close out the game searching for his fourth save of the season. He would get through the first two batters no problem but would give up a single to Nieuwenhuis but would end the game with a deep pop out to Kris Bryant who was transitioned to left field. I predicted that Jimmy Nelson would get strikeouts or throw home runs. With the wind blowing in, home runs weren’t in abundance but he did get six K’s in 5 1/3 innings. Hendricks would only go 5 innings with a no decision. Aside from Strops trouble, the Cubs bullpen would finish the Brewers off taking the first game of the series. Tommorow/today, whenever you read this, MLB player of the week and Mr Two-NoHitter Arrieta takes to the rubber, can he make it three??? Opening Day @ the Freindly Confines!!! I really try to keep my emotions out of these recaps but damn this one is difficult to contain because well spoiler alert, CUBS WIN, CUBS WIN!!! Now they’ve one on opening day in Anahiem and won 3 out of 4 in Arizona but there’s nothing like a win for the Cubs at Wrigley. Now I wasn’t there but the excitement deep within my gut was still there watching them get their first win at home today! So let’s go! John Lester opens up the season at home with a single to leadoff man Zack Cozart who would advance to third on a Joey Votto single to left field. He would then score the first run on a ground out by Brandon Phillips. He would make it through the second but would give up a home run to Billy Hamilton putting the Reds up 2-0. Brandon Phillips would lead off in the fourth with a single and would reach 2 on Devin Mesoraco’s ground out that was scored 1-6-3, which means Lester touched it, Addison Russell picked it up and threw it to Anthony Rizzo. Phillips would then steal third and score on Brandon Finnegans single to center. But that would be all she wrote for the Reds as Lester would allow one base runner in the fifth and sixth. Trevor Cahill would start the seventh off with a double to Adam Duvall but would stop him from advancing and would close out the inning. Reds starter Brandon Finnegan would coast through six only allowing base runners on walks with out any real damage until the seventh, which he would get through two but would give up a line drive single to center by David Ross. After a visit to the mound, he would walk Matt Szczur and get pulled for Caleb Cotham, only to walk Fowler and get replaced himself by Chicago area native Tony Cingrani. Jason Heyward would send a line drive to right scoring Ross & Szczur. He would get out of the inning to come back in the eighth. The top of the eighth would see former Yankee Adam Warren come into the game giving up a single to Joey Votto but finishing the inning out strong. Cingrani would get Rizzo to ground out but would walk Zobrist then hit Soler. Jumbo Diaz would come into the game and all but almost immediately give up a two-run home run to left center, putting the Cubs up 5-3. Ross would ground out and the guy that would take Starlin Castro’s crowd exciting, player clapping, mascot dancing walk up music, Munenori Kawasaki would line out to right. The Washington Nationals were pretty much everyone’s pick to win the National League east and the World Series this season. Now there’s no real concern after a 3-1 opening day loss to the New York Mets, but what may become an issue are the Nationals injuries. The Nationals are starting the season with 4 players on the disabled list. Denard Span has been out since March when he had core muscle surgery. Span was the engine that got the Nationals offense rolling last season and there’s a big hole at the top of the order with him out. Span may return at the end of the month, but it may also take him a while to get into game shape against major league pitching. Span missed a big chunk of spring training and you have to wonder if a minor league rehab stint will be needed to get him back on track. Jayson Werth is still recovering from the shoulder surgery he had in January. Werth did hit in some minor league games at the end of March and it shouldn’t be too much longer before he’s able to return to the Nationals line up. Just like Span; you have to wonder how far behind Werth will be since he’s been out for 4 months. Washington needs Werth’s bat back in the middle of their line up and they may get it about the middle of this month. Nate McLouth would’ve been the guy to fill in for Werth, but he’s out as well. McLouth had shoulder surgery in August of 2014 and has a difficult time returning from it. McLouth may be back this month as well, but hiss absence has been twice as long as anyone else and you have to wonder how far away he is from being ready to hit major league pitching. Casey Janssen was brought in by the Nationals to provide a some bullpen support and take some pressure off of closer Drew Storen, but Janssen landed on the DL with right shoulder tendinitis. Janssen is another Nationals player who may return this month, but it’s his throwing arm that’s the issue and you have to wonder if this will hang around all season long with Janssen. Storen had some injury issues as well during spring training, but didn’t end up on the DL. With Janssen out and Storen having some issues; what kind of shape is the Washington bullpen in? Anthony Rendon was talked about as being the break out player of 2015, but his year has started on the DL with an MCL sprain in left knee. When Rendon first got hurt it was reported as minor and that he would miss a few days. Then the report changed to Rendon would miss the rest of spring training, but he should be good to go for the start of the season. Then as the season was getting ready to start Rendon went on the DL with his time table being set for a possibly April return. Rendon has avoided knee surgery and the Nationals are right to be very careful, but they’re also missing a huge piece of their line up. On the plus side for the Nationals none of their starting pitchers have ended up getting injury. That may be enough to keep them in games and get them some wins early in the season, but with Soan, Werth and Rendon’s bats on the sidelines they’re going to have to find ways to score runs. There’s nothing that can derail a teams run more than injuries to their key guys. NASCAR took the week off last weekend, but they return Saturday in Texas for what has to be Dan the Man’s favorite race. the Duck Commander 500 at the 1.5 mile Texas motor speedway. Chris Olmstead from BeyondtheFlag.com will join our podcast Friday night around 10:30 p.m. to preview this race for you. It’s a full weekend in Texas for NASCAR. On Thursday from 4:30 pm-5:30 pm there’s NASCAR Xfinity practice. The Xfinity drivers return from 6:30 p.m.-8:00 p.m. for their final practice. Friday has a full day of activity starting at 11:30 am with NASCAR Sprint Cup Series practice. At 2:00 p.m. the Sprint Cup drivers hit the track again for their final practice. At 4:45 pm it’s time for NASCAR Xfinity Series Coors Light Pole Qualifying. After the Xfinity guys qualify the NASCAR drivers get back on the track around 6:45 pm for their qualifying runs. Friday night wraps up with the NASCAR Xfinity Series O’Reily Auto Parts 300. Then on Saturday night the Sprint Cup drivers will go 334 laps or 501 miles in the Duck Commander 500. Now normally on the podcast it’s Dan the Man who comes up with the conspiracy theories, but I actually have one of my own. Yesterday the St. Louis Cardinals and the Chicago Cubs had a night game schedule at Wrigley Field. Just a little after Noon I turned on the MLB Network to catch some updates and on their crawler at the bottom of the screen there was an announcement saying the Cubs/Cardinals game had been postponed. They where siting the weather that they predicted would hit the Chicago area. While it would’ve been a tough night to play baseball the rain and wind that was being forecasts to hit Chicago area didn’t. These two teams have another game scheduled for this afternoon and the weather outside is just as bad as it was last night and there is rain in the forecast. So the question is; will they play today’s game? Now there was no make up date announced for yesterday’s day and why do I have a feeling that the date will be after the construction at Wrigley Field is done. I’m pretty sure you can see what I’m implying here. I wouldn’t be shocked at all if today’s game ends up being called off because of the predicted weather. Even though Wrigley Field didn’t look bad on television Sunday night it obviously isn’t in the condition the team would like it to be. Not to mention the more games they can play after construction is done the more people they can squeeze into the ballpark. All you have to do is remember that Cash Rules Everything Around Me! Back in 1946, when I was eight years old, I finally started paying attention of professional sports. In the fall of that year, I started following the Chicago Bears via radio. (No TV as yet in those days.) With great interest and excitement, I listened to the radio broadcasts every Sunday afternoon. The Bears had a very good team and won game after game. Finally, they played the New York Giants for the title. I remember very little about that game with the exception of the score. I remember that the Bears had taken a 14-0 lead but the Giants made a comeback and tied the score at 14-14. Then, with Sid Luckman at the helm, the Bears took the lead via touchdown and added a field goal for insurance winning the championship 24-14. How easy is this, I thought to myself. It wasn’t because in 1947 , I became a fan of the Chicago Cubs. I only remember bits and pieces of listening to those games, but one thing remains quite clear; the Cubs were a bad baseball team! Before I started paying attention to baseball, the Cubs had won the NL pennant in 1945 and played the Detroit Tigers in the world series. Naturally, with the 7th and deciding game in Chicago, the Cubs were smoked 9-3. Even in 1946, they were respectable, finishing in 3rd place. Not so in 1947! It didn’t take me long to discover that this team was horrible. I can still remember some of the players I rooted for. Bill Serena, Handsome Ransom Jackson, Roy Smalley, Wayne Terwilliger, Andy Pafko etc. My personal favorite was the slugging outfielder Bill “Swish” Nicholson. In those days, the radio announcers (Bert Wilson; his catch phrase was “We don’t care who wins as long as it’s the Cubs!”) did the road games via a simulation with ticker tape. I remember one day when I was ill (a frequent occurrence in my youth) and listening to the Cub-Dodgers game from Brooklyn. It was easy to hear the ticker tape spewing out the information. Bert Wilson started to get very tense and dramatic and I had the feeling that something important was about to happen. With the score tied 1-1 in the top of the 9th and a runner on 1st, my hero, Bill Nicholson strolled to the plate and hit a home run with the Cubs winning 3-1. But good things like that happened very infrequently. In 1948, for example, both the Cubs and White Sox had dismal seasons and they both wound up in the cellar. The newly reformed Chicago Sun-Times (a merger of the tabloid Times and the Sun newspapers) flip-flopped the standings one summer day so it appeared that the Cubs and White Sox were on the top of the National and American leagues. The memories weave through my mind like fog. Fast forward to the early 50’s. After years of being cellar dwellers, the Cubs surprised the NL when they brought up an outfielder/1st Baseman named Bob Speake. Speake set the NL on fire winning games with his bat and his glove. I remember listening to one road game on the radio. Score tied 2-2 in the 10th; Speake at bat. (“Speake hits a high towering drive to left field. It’s a home run!”) That one even surprised me. Listening to it on radio, I thought it was a routine fly ball. Of course the league quickly caught up to Speake when they discovered he couldn’t hit a high inside fast ball. The Cubs, who wound up the 1st half of the season in 2nd behind Brooklyn did their usual fade towards the end of the season. Speake was soon traded to the Giants and was out of baseball in a couple of years. In my senior year of high school, 1955, I used to dash home and usually catch the last couple of innings of the Cub’s game. When I tuned into this one, there seemed to be more tension than usual. Sure enough, Sad Sam Jones had a no hitter going. With the Cubs leading 4-0 in the 9th, he walked the 1st three batters but, shockingly, struck out the next three to preserve the no hitter. Harry Creighton, who was usually half in the bag by the end of the game, interviewed Jones on the field after his no hitter. His first question?? “ How’s the family, Sam”! No joke that’s what he said. 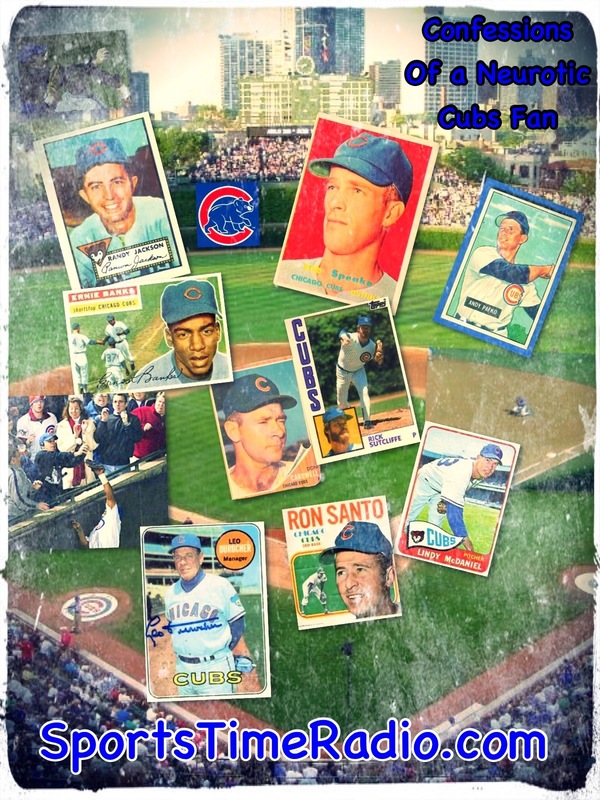 I saw a lot of games at Wrigley in 1963. One I still remember quite well. Cubs vs. Giants; game tied in the 10th inning and the Giants have the bases loaded, one out. In comes Lindy McDaniel in relief; he picks Willy Mays off of 2nd base and then strikes out the batter to end the inning. The fans stand and applaud. McDaniel bats for himself leading off the 10th and hits a walk off homer to win the game! With things looking bleak at Wrigley, the Cubs pull a shocker and hire Durocher as manager. A famous quote from Durocher after he took over the team. “This is not an 8th place ball club.”. He was correct. They wound up in 10th place because of the addition of 2 expansion teams. But Durocher turned it around in 1967. Beckert, Banks, Santo, Hundley, Williams, Kessinger, Williams, Hickman etc. In a game I attended at Wrigley Field before a packed house, the Cubs won 4-1. Lee Thomas, subbing for a injured Ernie Banks driving in the key runs. On Sunday, the Cubs won again and moved into 1st place! And the fans actually ran onto the field to celebrate. But they didn’t win that year or the next. We all know what happened in 1969. A great team with a poor center fielder, Don Young. Despite that, the Cubs had an 8 ½ lead over the Mets in late August. Typically, they collapsed while the Mets played out of their minds winning 41 out of 50 to win the pennant by 8 games. Then the not many years removed from expansion Mets beat the favored Baltimore Orioles to win the world series in 5 games. Durocher stayed around for a couple more years, but that magic was never repeated. Wild card teams get into the playoffs a couple of times but are quickly eliminated. And do I have to go through the Bartman game of 2003 one more time? I can’t even think about it. But remember this; if the Cubs SS didn’t boot a double play ball that would have ended the 8th inning, the Cubs still would have been leading 3-1. Kerry Wood gets hammered in the deciding game at Wrigley and bleeping Florida beats the Yankees to win the world series. The Cubs win back to back division titles in 2007-2008 and can’t even win one playoff game! But currently it’s different. I have no more patience to watch the current mediocre product. I’m tired of being patient and time is running out. When I was younger, there was always hope and optimism for next season but no more. The Cubs have become a non-factor in Chicago sports. At least, for now. Hey, how about those Blackhawks! !